Columbia, Maryland is an unincorporated city in Howard County, a rapidly growing county west of Baltimore. 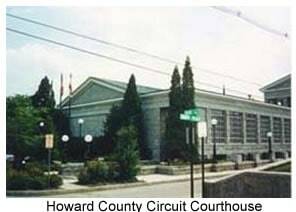 Personal injury cases in Columbia often wind up in Howard County Circuit Court or Howard County District Court, both of which are in Ellicott City. Columbia is a largely populated city of approximately 100,000 people. You would never know how big Columbia is when you walk into a Howard County courthouse, because it is not a busy courthouse. To put its size in context, there are six times the number of Circuit Court judges in Baltimore than there are in Howard. From a personal injury accident and medical malpractice standpoint, this is a little misleading because the crime rate is so much higher in Baltimore City. For example, there are 27 times more carjackings in Baltimore City than in Howard County. Still, you get the point: there are, relatively speaking, not a lot of personal injury accident cases that got to trial that originated in Columbia. Why? The reason is that most view this county as a below average jurisdiction to try personal injury cases on behalf of injured victims. But opinions vary wildly on it as a venue in accident and malpractice case. Certainly, there are some types of plaintiffs that do extremely well in front of these juries. They tend to be credible people that are very seriously injured.... and remind the jury of themselves. Howard County jurors are a little bit like Walmart shoppers. They will buy, but they want to get value for their money. From a juror's standpoint, they want to reward someone who is really hurt and really deserves to be compensated. Conversely, plaintiffs with minor accident claims withInj soft tissue injuries are almost invariably going to struggle. So the more serious the injury claim is, the less impact the jurisdiction will have on the verdict. Get a better idea of the settlement and trial value of car accident and other Columbia personal injury cases. Our lawyers are not afraid to try a good case here. But, let's be honest: there are better jurisdictions. You cannot assume that the case can only be filed in Howard because the accident or malpractice occurred in Columbia. Some of these lawsuits are more appropriately brought in neighboring jurisdictions and it is sometimes foolish to proceed with a case in this jurisdiction if there are other viable options in sister jurisdictions that are appropriate and better suited for the case. The best lawyers consider all possible venue options before determining where to file suit. We handle a substantial number of serious personal injury cases in Columbia, Maryland. We know the area well. One of our partners has lived most of his life in Howard County. More importantly, we know the jurisdiction well and fight hard - really hard - to get our clients as much money to compensate them for their injuries and losses as possible. If you have been injured in a motor vehicle accident or by medical malpractice in Howard County, call us at 800-553-8082 or get a free consultation on-line.